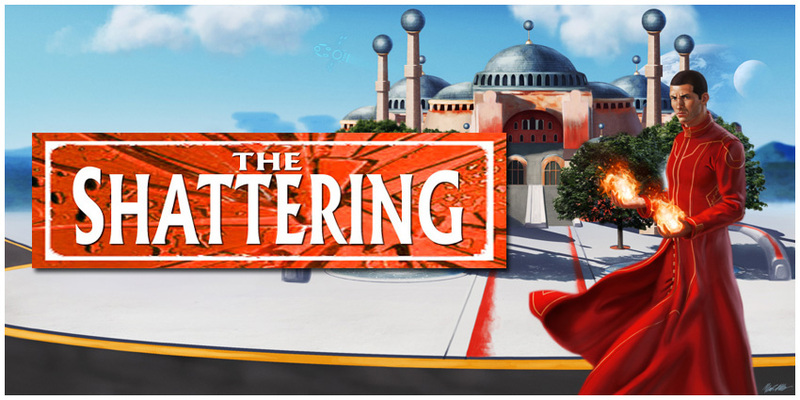 The critically-acclaimed novel that introduces the universe of The Shattering, the gods of the Above--and the demons of the Below! And now I, the exiled dark lord Lucian, race across the planes of creation, a charge of mass murder upon my head, vicious foes dogging my every step. My goals are simple: Justice for myself, vengeance upon my enemies, and conquest of the known universe if I get half a chance. But events are conspiring to bring me together with some very unexpected allies, and to thrust me into the most unlikely role of all... HERO?! On Kindle and in Paperback via Amazon.com HERE. Cosmic gods are born as alien agendas are revealed, mighty star fleets clash and the galaxy stands on the brink of annihilation! 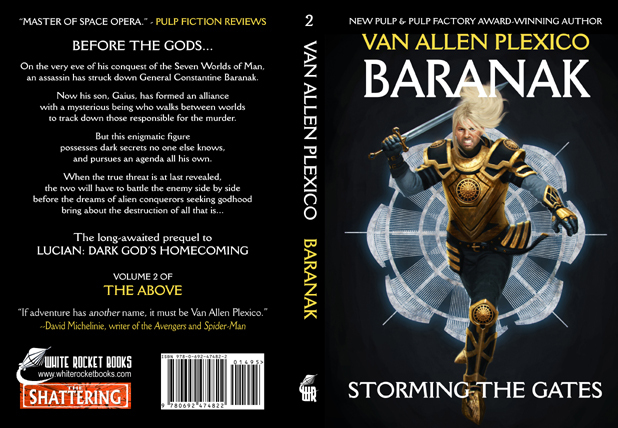 This book tells the story of the earliest days of the SHATTERING saga, revealing the age before the gods of the Golden City--and the origins of the mightiest beings in the galaxy. On the very eve of his conquest of the Seven Worlds of Man, an assassin has struck down General Constantine Baranak. Now his son, Gaius, has formed an alliance with a mysterious being who walks between worlds to track down those responsible for the murder. But this enigmatic figure possesses dark secrets no one else knows, and pursues an agenda all his own. And in deluxe Hardcover HERE. 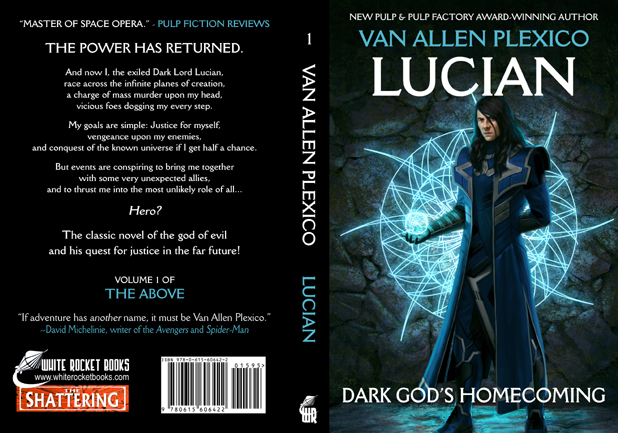 The beloved Ice Queen from LUCIAN: DARK GOD'S HOMECOMING and LEGION III in her own adventure! Freed from millennia of imprisonment, the prime disciples of the deathgod Vorthan search the galaxy for six Cosmic Weapons of immense power that they can use to restore their former master to existence. Among those six objects are the legendary golden Sword of Baranak and Karilyne’s own mighty Axe. 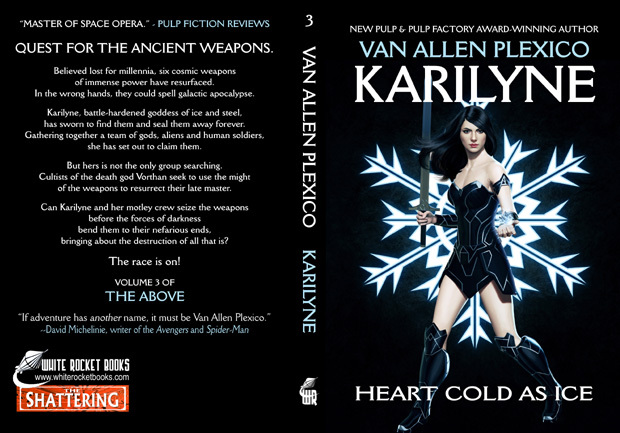 Thus the Ice Queen herself is drawn into the chase, attempting to hunt down the Weapons before the forces of evil can acquire them. Along with her on the journey she brings the Dyonari swordswoman, Mirana; Binari, a Rao Technologist; Solonis, the god who travels through time; and Davos, a massive alien of mysterious origins; plus other surprising allies. Ahead of her await Vorthan’s dark disciples and horrific alien menaces, as well as the super-soldiers of Legion III and even the mighty Hands of the Machine. 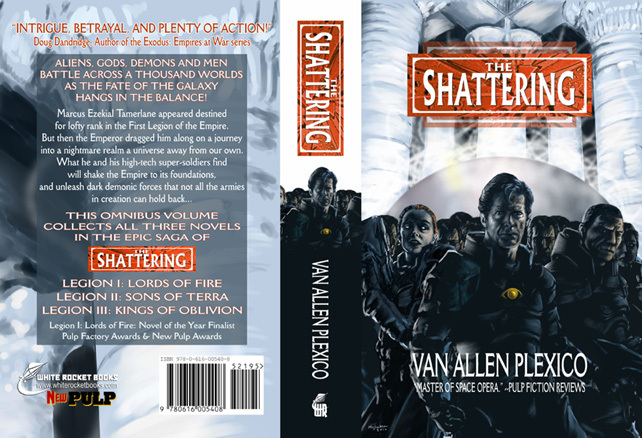 Volume 1 in the SHATTERED GALAXY series! In the wake of THE SHATTERING come the Hands of the Machine and war in a Shattered Galaxy! The galactic agent known as HAWK has awakened too soon in a galaxy shattered by apocalyptic warfare. His master, the Machine, is possibly insane, and the great Adversary of Man has returned. Now he must confront his former allies, turned renegades and pirates instead of soldiers. His new mission is simple, yet perhaps impossible: He must unite them--or all life in our galaxy will end! 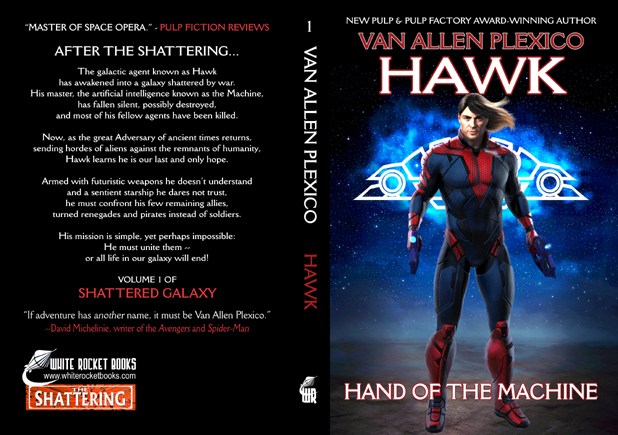 HAWK: HAND OF THE MACHINE is vintage Van Allen Plexico-- stripped-down, all-out Military SF/Space Opera Pulp action and adventure in the grand tradition, with bold heroes, deadly menaces, and the future of the very galaxy at stake! On Kindle via Amazon.com HERE. In paperback via Amazon.com HERE. Aliens, gods, demons and men battle across a thousand worlds as the fate of the galaxy hangs in the balance! Omnibus Paperback and Kindle eBook via Amazon.com HERE. –Doug Dandridge, author of the Exodus: Empires at War series. Stripped of his authority by the Emperor of Mankind and assigned to duty in deepest space for failing to prevent the greatest robbery in history, Ezekial Tamerlane believes his career as a soldier is over. But strange forces are at work, urging the Emperor to set out on a journey fraught with dangers into a nightmare realm a universe away from our own; and Tamerlane, like it or not, is going along for the ride. 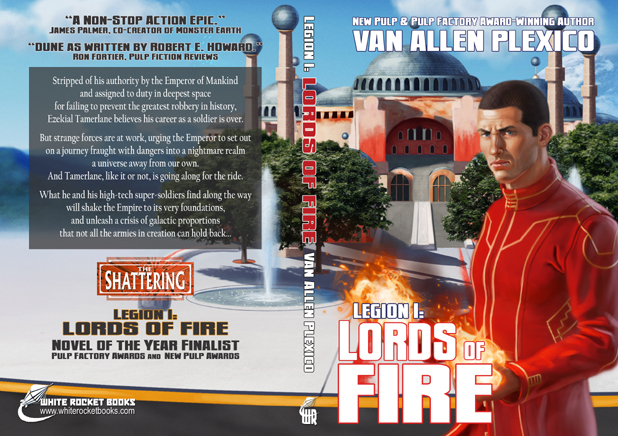 Hear an audio excerpt from LEGION I: LORDS OF FIRE, read by the author! In the spirit of Warhammer 40,000 and the Horus Heresy! Armies of super-soldiers clash as massive colossus walkers loom over the battlefield. Ancient demons and godlike beings awake. And three mighty Legions converge to do battle upon the sun-blasted sands of Ahknaton! Rebelling against Imperial rule, planetary governor Rameses has retreated to his base world of Ahknaton and proclaimed himself a living god. With the Empire crumbling, attacked by all its foes at once, General Marcus Ezekial Tamerlane must lead a desperate mission to assault Ahknaton and end Rameses’ treachery. But the forces he confronts are darker than he knows. 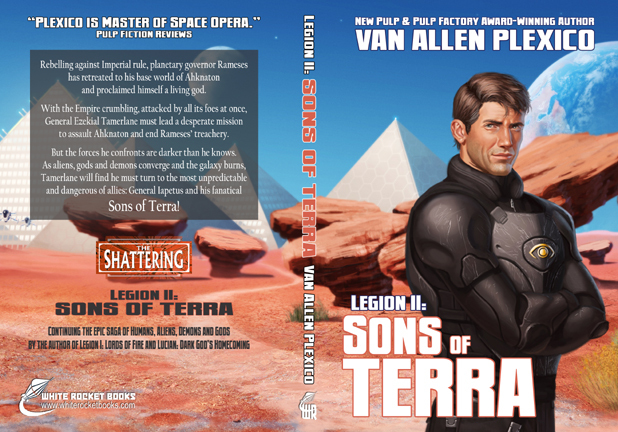 As aliens, gods and demons converge and the galaxy burns, Tamerlane will find he must turn to the most unpredictable and dangerous of allies: General Iapetus and his fanatical Sons of Terra! Hordes of aliens under Goraddon's diabolical control have swept across the worlds of Man, leaving only death and destruction in their wake. Humanity's greatest champions are striking back, hurling giant mechs, hovertanks, starfleets, and legions of super-soldiers at the foe. But not all allies are what they seem to be, and treachery awaits at the most critical moment. Now the fate of all existence rests on the will, the judgment--and the strong sword-arm-- of Arnem Agrippa and the unmatched fury of his III Legion, the legendary Kings of Oblivion! “A mind-blowing, action packed finale far greater than anything we could have imagined." 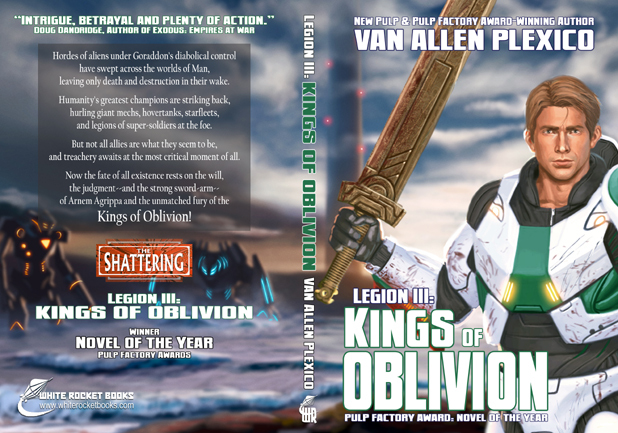 A Novella of THE SHATTERING/LEGIONS Saga - perfect for new readers and veterans of the three Legions alike! Two commanders and their special ops teams in a race against time--through a deep, dark maze filled with death! 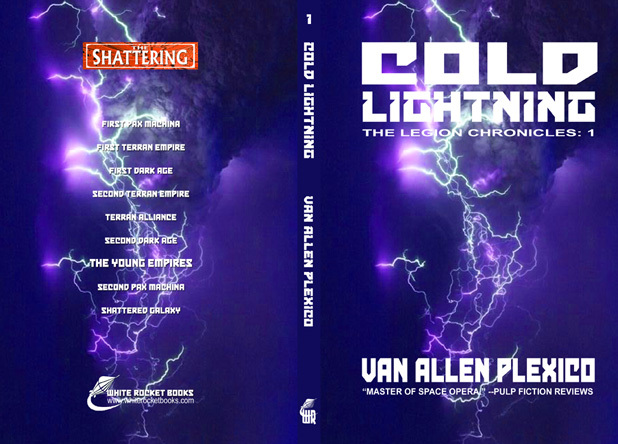 On the orders of legendary soldier Arnem Agrippa, Major Selim Iksander ("The Lightning") races against time and against his rival, Major Yevgeni Vostok ("The Cold"), through a labyrinthine maze deep beneath the fortress-world of Candis. At his side are four carefully selected allies-- a star pilot, a cleric, a Marine and a Ninja-like stealth warrior--ready to handle anything Vostok can throw at them. But more powerful entities have awakened-- and now the dark tunnels in the bowels of the fortress-world have become a death trap from which none of them may escape alive.